Sorghum Molasses for sale. Buy online at Zingerman's Mail Order. Gourmet Gifts. Food Gifts. As the name implies, sorghum molasses is made from grain sorghum (it's not a sugar cane by-product). Most of the twenty-four hundred acres that produce sorghum in the U.S. are in Tennessee or Kentucky, where the Old Order Amish Yoder family settled in the 1970s. The Yoders plow their farm with a team of mules and the family works the land without machine. The cane is mature when the seed heads turn brown, then it's cut and pressed to extract the juice. The juice is collected in a large vat where it's boiled and evaporated in a process similar to the production of maple syrup. 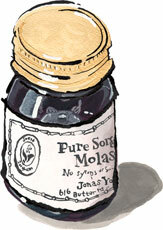 Sorghum molasses is sweet, but it has exceptionally complex depth too. Notes of burnt sugar and caramel are there, and the flavor is very long lasting. It's a great topping on biscuits or bread. It's also good when used to sweeten up bitter vegetables: roast some brussels sprouts and drizzle a bit on them just before serving. If this is out of stock—and it often is—it's partly due to a distinct lack of technology on the part of the makers. They're Amish so they have no phone, no fax, no internet. We rely on a friend who takes our order, walks it to the farmers and helps get it filled. Please click "tell me when it's back in stock" below, and we'll send you an email as soon as our next shipment arrives. Special thanks to our sorghum molasses mule, Charity. "...a bourbon softness more subtle than any molasses." "That sorghum is too good on vanilla ice cream or biscuits. Yum. Not so great with wine, however."